European Tribune - Confirmation Bias? I also believe that not a lot of significance may happen between now and 23rd. May, the starting date for the European Parliament elections. Westminster is in recess, and Theresa May has survived (again). The May Corbyn talks are being kept on life support so that both sides can claim they are doing something positive to resolve the mess, but it is in neither leader's interest to actually come to an agreement. Any agreement they could strike would probably split both the Labour and Conservative parties and might not pass in the House of Commons even with both leaderships applying the whip. Corbyn has absolutely no incentive to bail out Theresa May, and May has now achieved her immediate objective for the talks of providing a pretext for securing another A.50 extension. It has come at the price of having to take part in the EP elections, but she can always claim that they are irrelevant in the context of delivering Brexit. Until she can't. What happens if the turn-out is much higher than previous EP elections and results in a large surge of support for Remain or second referendum supporting parties? Strangely for a departing member UK European Parliament elections turnout has actually increased slightly over the years, while it has declined almost everywhere else. A poll for the Open Europe think-tank by Hanbury Strategy indicates the Tories would suffer a crushing defeat if the elections took place now. 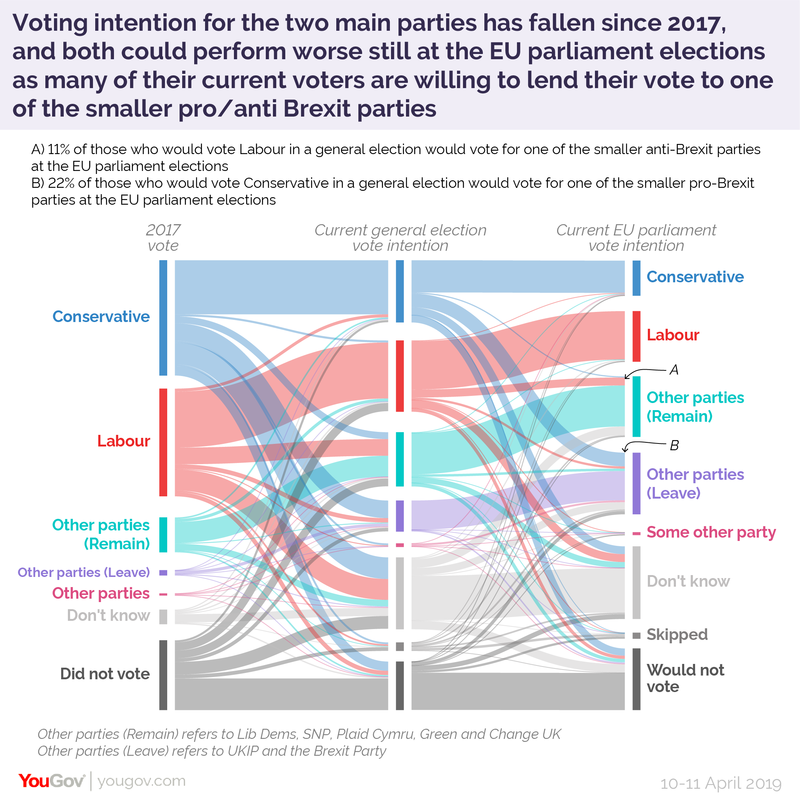 Basically a 60:40 split in favour of Remain or second referendum supporting parties... This compares to the results of the 2014 UK EP elections as follows: Labour 25%, Conservatives 24%, UKIP 28%, Lib Dems 7%, Others 18%: Almost identical to the 52:48 referendum result if you count Labour as a Remain party and the Conservatives as Leave. 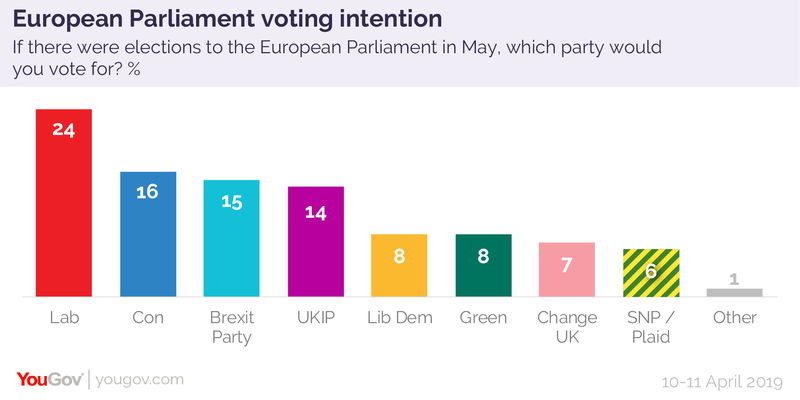 Basically, since then, Labour has gained over 10% support at the expense of hard Leave parties: UKIP and Farage's new Brexit party. The trend line is based on the average of the previous 15 polls. Basically the Tories have been in free fall since Theresa May failed to "deliver Brexit" at the end of March and the Labour decline has halted. Recent polls all show Labour ahead. Strangely, there has been no Remain/Leave polling since March, but March polls all show Remain well ahead, often by double digit margins. Interestingly, some February polls show Remain ahead of leave by c. 50% among Labour 2017 voters living in Northern England and the Midlands - supposedly the heartland of Labour Leave supporters. Another February poll shows Remain ahead of Leave by 62% among respondents of voting age only since the 2016 referendum, and by 26% among non-voters in the 2016 referendum. If Corbyn is worried about splitting the Labour party, it seems he has less and less to worry about. Most polls show undecideds in the 10-30% range, so there is still plenty to play for. However it is hard to see those voters plumping for the Conservative party, given the humiliations it has wrecked upon the country since February. GRASSROOTS Conservatives are set to "go on strike" and boycott the European elections after Theresa May extended Article 50, it emerged today. Theresa May was forced to plead with the EU to extend Article 50 until June 30 to prevent the UK crashing out of the bloc without a deal. In her letter to the President of the European Council, Donald Tusk, the Prime Minister said the UK would be participating in the European elections on May 23. But according to local party chiefs, "a lot of Tory activists are going to be on strike" because of the extension. Dinah Glover said: "They just don't have that commitment - they're just not going to put weeks of their lives on hold to campaign for something they don't believe in. "Going out to campaign would be giving a very literal example of the fact that we are still in the EU. 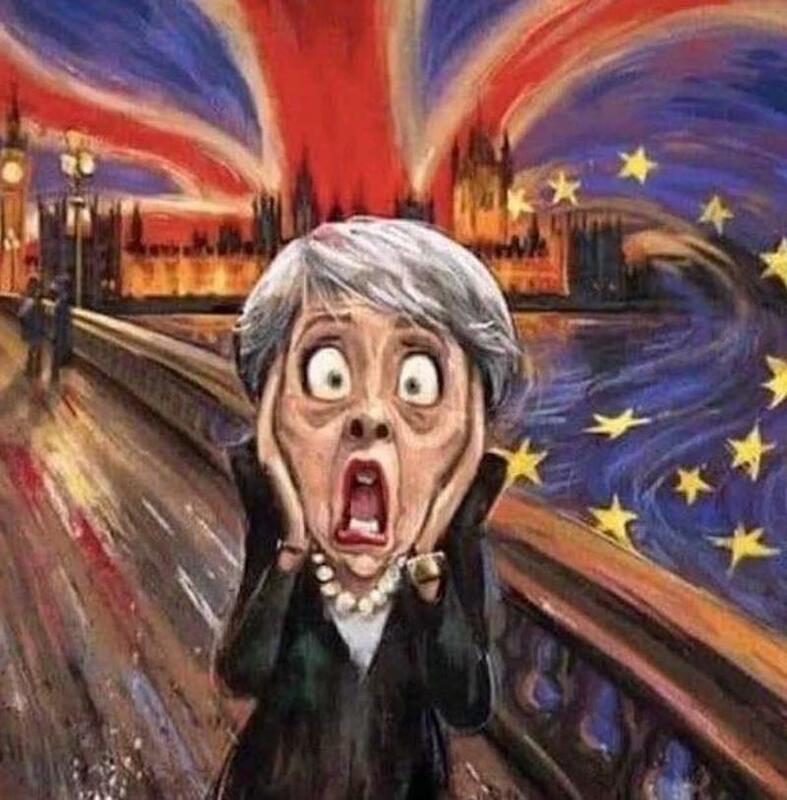 The mood among Tory activists is hardly going to be improved now that May has actually agreed a Brexit delay until October 31st. Basically I see no reason to alter my prediction in Off the reservation that the Tories will win only 15% of the vote and that the turnout will be high compared to previous EP elections. The Hanbury poll cited above found that "The survey also suggests that Remain supporters would be more likely to vote - 47% compared to 38% of Leave voters" which should increase the Remain parties margin of victory. So we have the perfect storm for Theresa May. Unable to get rid of her until December, her party has effectively gone on strike. Her supporters are much less likely to go out and vote, and Remainers - disappointed by the response to their 1 Million march and 6 Million petition signatures - are likely to turn the EP elections into an effective second referendum vote. If Remain and second referendum supporting parties can rack up in excess of the 17.4 Million who voted Leave, the argument could well be all but over. Annunziata Rees-Mogg : Voice of the people. As for Thatcher, I loath the ground she walked on, but she'd never have had any truck with referenda and would have destroyed the juvenile pretentions of the Leavers with a single basilisk stare. Neither the Mail nor the Telegraph would have dared raise a peep in her earshot.